Tix on Sale Now: Ancient Future "World Without Walls" Lineup Reunion! Tix: $16 in advance, $20 at the door. Buy Tix. Poster (944 k pdf). Facebook Event. Full Press Release. Ancient Future circa 1990. Photo by Irene Young. On June 7, 2011, the exact lineup of Ancient Future that performed on the band's influential World Without Walls and Asian Fusion recordings will reunite to perform for the first time in over 15 years. 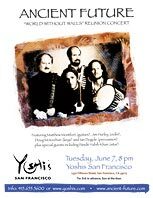 The reunion show at Yoshi's San Francisco features Matthew Montfort on scalloped fretboard guitar, Jim Hurley on violin, Doug McKeehan on keyboards, Ian Dogole on percussion, and special guests from the band's recordings including noted sitarist Pandit Habib Khan, who appears with this exact band lineup on the song "Socha Socha" on the Planet Passion recording. This is a one-time-only chance to catch this special reunion performance by the lineup that played over a hundred concerts together between their first appearance on August 21, 1988 at the Concert in the Forest, a benefit for the Friends of the Cathedral Forest near Breitenbush Hot Springs, Oregon, and their August 26, 1995, show for the Calaveras Arts Council. During this time, Ancient Future was the subject of numerous features in publications such as JAZZIZ and MÚSICA GLOBAL. A selection of these articles has just been uploaded to the archives of Ancient Future history, providing an interesting perspective on a period of growth in the world music movement. 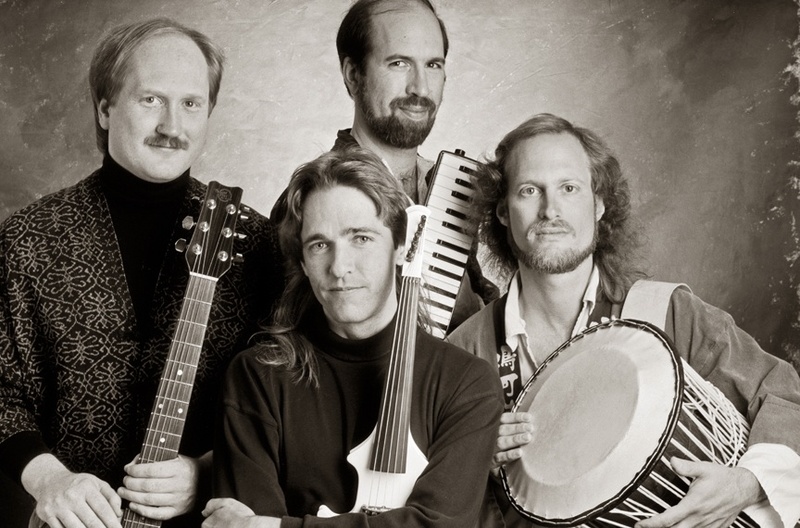 Ancient Future's uptempo virtuoso world fusion music is an exhilarating mix of jazz improvisation with the exciting rhythms, exotic sounds, and enchanting melodies of world music. Info: 415-457-3993 or visit www.panamahotel.com. 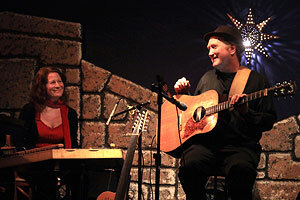 Scalloped fretboard guitarist Matthew Montfort and santurist Mariah Parker will perform music from Ancient Future's repertoire as well as Seven Serenades for Scalloped Fretboard Guitar by Matthew Montfort, and Sangria by Mariah Parker. This is a contest anyone can win while tickets are still available! Simply visit http://professorlim.org/index.php?pr=World_Music_Showcase_Tickets and reserve your tickets. That's it!